Virginia Tech shot an uncharacteristic 26.9% from three-point range, but it didn’t matter, as the No. 16 Hokies played better on defense and beat Ball State 73-64 on Thursday afternoon in the opening game of the Charleston Classic. Tech is now 2-0 on the season. Ball State, who dropped a close game at No. 23 Purdue last weekend, fell to 1-2. Buzz Williams was not pleased with his team’s defensive effort in their season opener against Gardner-Webb, despite the fact that they forced 29 turnovers. They allowed Gardner-Webb to get the ball into the paint too many times, and they got too many good looks at the basket as a result. Though not perfect, Thursday’s performance was much better. Ball State won 19 games last year, and they returned a lot of experienced talent, plus they added two transfers from the SEC. The Hokies still controlled the game from start to finish, despite brief moments from the Cardinals. Ball State shot 42.3% from the field, and overall it was a better defensive performance by the Hokies against a team much better than Gardner-Webb. The other thing the Hokies improved upon was their turnover rate. They had 20 turnovers against Gardner-Webb, but just nine in 40 minutes of basketball against Ball State. They were +5 in turnover margin, and outscored the Cardinals 20-15 in points off turnovers, which helped to negate the tough night shooting from the outside. They also won the rebounding battle 33-32, though they’ll be disappointed to have allowed 11 offensive rebounds. Sophomore guard Nickeil Alexander-Walker led the team with 21 points for the second consecutive game. He was 9-of-15 from the field, and he also had six rebounds and three assists. Kerry Blackshear had a very effective game on the inside with 18 points and seven rebounds in 25 minutes. Senior point guard Justin Robinson added 15 points, six assists and four steals, though he also had four turnovers. Ball State led this game twice in the first half, by as many as five points. They led 22-17 with just over nine minutes remaining in the first half, but the rest of the half belonged to Virginia Tech. Nickeil Alexander-Walker began the run with a layup and foul, converting the three-point play the old fashioned way. Justin Robinson ended the run with an extremely deep three-pointer at the buzzer. 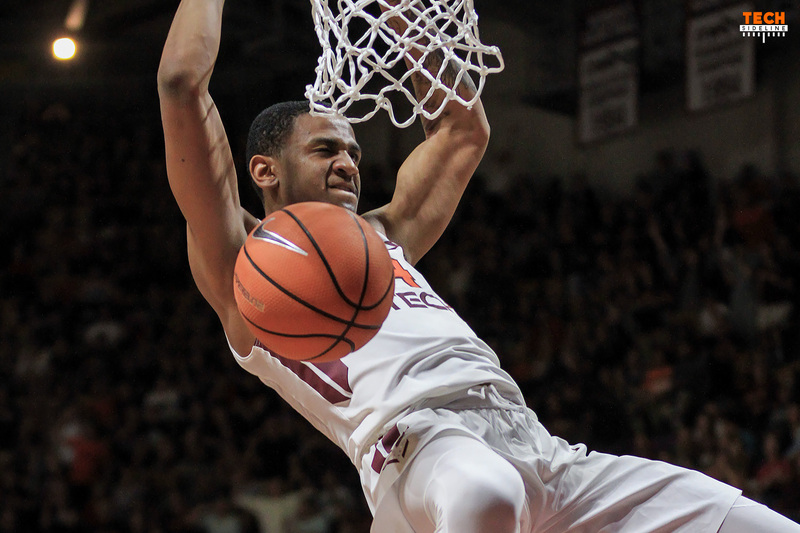 Between Alexander-Walker’s basket and Robinson’s buzzer beater, the Hokies outscored Ball State 26-7 over the final 8:44 of the half. The Cardinals came out firing in the second half, and they cut Virginia Tech’s lead to 49-44 with 12:32 remaining. However, Virginia Tech responded with 20-8 run over the next seven minutes to take a 69-52 lead with 5:36 remaining in the game. Ball State did not get within single digits again until they hit a three-pointer with four seconds remaining to make the final score 73-64. The Hokies return to action on Friday morning at 11 AM. They’ll face Northeastern, who hammered Alabama 68-52 on Thursday. Northeastern returns all five starters from last year’s team, and they received 35 of 40 first place votes in the preseason CAA Poll. The game will be televised by ESPN2. I listen to radio broadcasts with the Virginia Tech sports App. Works great. So far so good as in avoiding those early season head-scratching losses that go back to the days of Greenberg. Per CCs article it may not be a spectacular win but it seems like a nice one. Will this game be on satellite radio? I have Sirius/XM radio in my truck and will be driving to Blacksburg for the football game Friday morning. Would be nice to listen to the game. I doubt it. But if you can turn off Sirius, Jon and Mike will be calling the game for VT, like every other basketball game. That’s 105.3, The Bear, in Blacksburg (local radio). Roanoke also carries it (92.5 I think), and not sure about Staunton area’s coverage of The Hokies. Yup, I use this every game. Works great. Actually it’s 96.9FM in Roanoke for basketball. 93.5 only does football. I listened to today’s game on Sirius/XM with VT’s play-by-play. I think it was one of the ACC channels up around 180. If you have ESPN on your provider, you might get access to watch espn on your phone when you have access to data. You might be able to listen to the tv broadcast while driving.